The government has decided to proceed against contract doctors, terming their mass casual leave as “unauthorised”, making their previous service ineligible for counting towards eligibility for postgraduation and the length of service for regularisation. Medical services were affected in the state, particularly the rural areas, as about doctors appointed on contract basis remained on mass causal leave for the second consecutive day today. The state government has decided to use the services of retired officials of the agriculture department to solve problems of certification of agricultural produce in the state. The Farm Technocrats Forum, a body of retired officials of the department of agriculture, would be assigned the job of certification of organic produce. The government will consider recruitment of rural youth as water guards on part-time basis to manage drinking water supply schemes in different parts of the state. The Himachal Pradesh Fruit and Vegetable Growers Confederation has lambasted the government for its failure to keep the roads open and arrange adequate number of trucks for the transportation of apple. After the coffee table book “Har Ghar Kuchh Kehta Hai”, released early this week, another book, providing a peep into the romantic past of the erstwhile British Summer capital through fascinating real tales of love, has arrived. Though the agriculture department is maintaining that the leftout double cross maize seeds of an American company purchased by the department for distribution to farmers on subsidy will be sent back, eyebrows are being raised here on overstocking of the seeds. A case of grabbing pasture land by certain locals, Nepali and outside contractors have come to light in Chandra and Bhaga valleys in this land-locked tribal district. Thousands of bighas of forest land have been grabbed to grow potatoes and peas under the nose of the district administration. 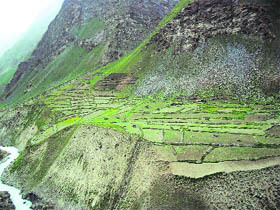 A view of the pasture land in upper reaches of Darcha in the Bhaga valley opposite to the Keylong-Baralacha part of the national highway in Lahaul. A novel way of evading tax by truckers in the Baddi-Barotiwala-Nalagarh (BBN) industrial area has come to the fore with the police registering a case of forgery and cheating against three truckers today who were found operating on fake permits. The commuters on the Kiratpur-Manali National Highway-21 and the Mandi-Pathankot national highway have remained stranded at Dadour for nine hours at Shahpur for six hours due to a breach in Daddour bridge and a series of landslides on these highways due to yet another spell of heavy rains today. Following complaint of Seema Devi of Rinna village near here, the police today lodged a case of torture against her in-laws. Asha Devi (35) , wife of Bhupender Singh of Jhabola village near Shah Talai, and a teacher in Government Primary School, Kyara, in Hamirpur district, was killed on the spot as the motor cycle on which she was riding on the pillion, struck against a speeding truck near her Jhabola village, about 65 km from here, last evening. The police claimed a breakthrough today in the murder case of a retired police officer on Wednesday. K K Indoria, Superintendent of Police, here said the arrests were made on the basis of strong suspicion and clues available with the police. He said it was the complainants who were allegedly involved in the murder. An official spokesperson said a show-cause notice would be served on all doctors who had gone on the unauthorised leave. He said the government had offered appointment to the willing doctors in the Rogi Kalyan Samitis (RKS) after issuing advertisements in various newspapers in which their terms and conditions were clearly specified. The places of posting were selected by the doctors and they joined the service as per the terms and conditions which never provided for any regularisation. The government had recently enhanced their emoluments and also provided for annual increase. It made the RKS and other doctors eligible for postgraduate seats and these had been increased from 66 to 70 per cent , which would further increase to 95 per cent. The number of seats had been increased from 38 to 75 and further go up to 100. The RKS policy did not provide for regularisation but the government decided to make a provision for their regularisation and reduced the period for it to 6 years from 8 years and location-based incentive extended to contract doctors on the RKS pattern. The decision to recruit 150 doctors on a regular basis was made after detailed discussion. It was in this background that the government had decided to serve notices on doctors for wilful absence from duty. The primary health centres, where most of the staff was recruited through Rogi Kalyan Samitis, were the worst-hit. In district and sub-divisional health institutions the regular staff was burdened with additional work. A spokesperson of the joint action committee of the contract doctors said they would remain on leave even tomorrow when the future course of action would be decided at a meeting to be held at Bilaspur tomorrow. The government should consider the demand for regularisation seriously as direct recruitment of 150 doctors through the commission would put contract doctors who joined five years back and those who joined two months ago on the same pedestal. A majority of the 150 posts would be filled by postgraduate doctors and hardly a few would be left for MBBS doctors. The committee claimed that over 90 per cent of contract doctors were on strike and the statement of health minister Rajeev Bindal that only a few doctors had gone on casual leave was misleading. It pointed out that if the state government hired a doctor on contract basis, a part of the salary is paid by the Centre and if all the doctors are regularised the state would have to bear the expenditure which it did not want. Instead of appointing 150 doctors on regular basis, the government could regularise the services of as many contract doctors. The state was not able to utilise the funds under the national rural health mission due to shortage of doctors. Ram Subhag Singh, secretary, Agriculture, gave this information while interacting with scientists and farmers at Palampur Agriculture University today. He was here to preside over the launching ceremony of Rs 2.78 crore project on organic farming promotion in Himachal Pradesh. Certification of organic crops is a major bottleneck in motivating farmers for going organic. Though a large number of farmers are willing to switch to organic farming, there is no agency in northern states, including Punjab, Himachal or Haryana, to certify their produce as organic. If the produce of farmers is certified as organic, it can fetch high price for them in premium market of fruits and vegetables. Though the government has decided to use the services of retired government agriculture officers, the process of getting an agency with international recognition is long and a complicated procedure, the experts told The Tribune. The secretary also said the Himachal government was planning to introduce two projects on organic agriculture in eight districts of the state. Under the projects the farmers would be encouraged to adopt organic farming. S.K.Sharma, Vice-Chancellor, launched the project. The university will develop technology and data to propel organic agriculture movement in the state, he said. J.C.Rana, Director of Agriculture, HP, asked the university to produce package of practices and other farm literature on organic agriculture. There was need to identify such crop varieties which required less fertilisers. Gopal Mehta, president, Himachal Organic Farmers Association, said organic produce was certainly better in shelf life and quality and was fetching good value in market. S.P.Sharma, Director of Research, said excessive use of chemicals had made farm produce, especially vegetables full of chemicals, hence there was need for integrated nutrient management. Y.S.Paul, Head of organic agriculture department, detailed about the project which will be implemented in three years involving 2600 farmers on 1300 hectare area in Kangra, Mandi, Kullu and Shimla districts. Stating this while presiding over a review meeting of the irrigation and public health department, Chief Minister Prem Kumar Dhumal said deployment of water guards would generate employment for about 5,000 persons, besides ensuring proper maintenance of schemes and regular supply of water to the people. He underlined the need for revival of traditional water bodies and said more check dams were required all over the state to store rain water. He said common land where water bodies existed earlier must be freed from encroachers and put to use for storage of rain water. He said gas chlorination system would be introduced in major drinking water supply schemes in place of the bleaching powder. Underlining the need for timely completion of projects he said priority must be accorded to the schemes in which more than 60 per cent work had been completed. Dhumal said out of the total 56 urban drinking water supply schemes as many as 43 schemes had already been augmented and work on the four schemes was in progress. Sewerage system had been provided in 17 towns and work was in progress in 22 others. The schemes for Sujanpur and Sarkaghat would be completed during the current financial year. Irrigation facilities had been provided to 2.37 lakh hectares and another 6500 hectares would be covered during the current financial year. The Rs 310.89 crore Shah Nehar Project, which would irrigate 15,287 hectares in 93 villages, would be completed by March, 2012. General secretary of the confederation Sanjay Chauhan said lakhs of apple boxes were stacked by the roadside awaiting transportation to market as trucks were not available. The growers were running from pillar to post to get trucks and the pending demand in Rampur, Dalash, Rohroo, Jubbal, Kharapathar, Kotkhai,Chopal, Nankhari, Theog and other areas had gone up to 1150 trucks. It took eight to 10 days of tireless efforts to find a truck for which the grower had to pay several times more than the rate of Rs 41.60 per box from Jubbal to Delhi. The book “Love Stories of Shimla Hills”, authored by Minakshi Chaudhary, unveils 16 true love stories, right from 17th century onwards to the present day. It narrates some interesting but not much-known “love affairs” and at the same time answers some queries pertaining to popular tales and brings out new some aspects. Apart from telling the real story behind the Scandal Point and throwing light on the colourful love life of celebrated painter Amrita Shergill, Chaudhary also provides interesting details of romance between Edwina and Jawaharlal Nehru. It also reveals the real tale of Shanta featuring in the popular pahari folk song “O’ ladi Shanta” fame and, of course, the story how Sadhana, the heroine of “Love in Simla” fell in love here. Releasing the book, Chief Minister Prem Kumar Dhumal lauded the efforts of the young writer who has now nine titles under her belt. Her books include the bestselling “Ghost Stories of Shimla Hills”, Whispering Deodars, Writings from Shimla Hills, Destination Himachal, 120 offbeat and A Guide to the Land of Gods. Chaudhary says that the very ambience of the picturesque hills with romance lingering all over make Shimla an ideal place to set every heart on fire and she realised while working on the book that these tales are inseparable from its ambiance. The stories pertaining to different eras also bring out the transition in the ways of expressing love from rose-scented hand-written letters to the modern SMS, internet chatting and phone calls. In Hamirpur district alone, 700 quintals of maize seeds purchased from this company by the department have not been purchased by the farmers in the district during the sowing season and is lying unutilised. This was for the first time that double cross variety of maize seeds were purchased from an American company on reportedly higher rates and the Congress had demanded probe into its purchase. There were reports of crop failure of some seeds supplied by this company from many parts of the country. Even the state government had asked the agriculture department to observe the growth of the crop grown from these seeds after procuring field reports. While single cross maize seeds were purchased at Rs 41 per kg, the double cross variety was purchased at almost the double the price at Rs 91 per kg. Since the sowing season of maize crop is already over in the state and good amount of the double cross maize seeds are lying stocked in the sale counters of the agriculture department throughout the state, eyebrows are being raised as to why such a huge quantity of the seeds was purchased by the department. The district administration of Lahaul-Spiti has already removed encroachments worth 3000 bighas of land from the possession of land grabbers. Land grabbers are working in connivance with local officials as they get money from them at the end of the season, alleged locals. They are never booked as it has been happening ever since potatoes and peas emerged as the main lucrative cash crops in the tribal belt since 1980s, they revealed. The land grabbers have reached Chatru along the Chandra river. From Sissu, Koksar, Gramphu towards Chatru on both sides of the Chandra river, a huge chunk of land have been fenced and peas and potatoes crop are sown. Interestingly, a non-tribal family from Mukerian, Punjab, now settled in Kullu, has claimed to own a huge chunk of land in the Chandra valley at Chatru, though the Tribal Act forbids outsiders from buying any land in the tribal area. But the owners claimed that their ancestors had bought the land long time ago. This correspondent found that a huge chunk of forest land in Darcha area along the Keylong-Patseo stretch of the highway has been tilled to grow peas or potatoes. Shepherds said they used to graze their livestock in the pastures, but these had been fenced now. Divisional forest officer GS Chandel said “We have set up a 4-tier committee at panchayat level that will recommend as to how much land a owner can get under the Act”. Chandel said the committee would report to the SDMs who would submit reports to the DC who is the chairman of the district-level committee. DC Lahaul-Spiti, Ritesh Chauhan said they had already vacated more than 3,000 bighas of encroachment from the forest land in a recent anti-encroachment drive in Darcha and Sissu areas. “We will now remove encroachment from Koksar and Chatru”, he added. SP Baddi Chander Shekhar Pandit said they had received a complaint from the RTO, Solan, where some trucks operating on fake permits had been impounded in other states like Uttarakhand and Punjab. A case under Sections 420, 467, 468 of the IPC for cheating and forgery had been registered and investigations were being conducted. He added that the trucks (HP-12 C-8347, HP-12-C-8913 and HP-12C 5485) had been found operating without valid permits and their owners had been identified as Ram Chand of Baruna, Mohammed Mushtaq of Nalagarh and Sunder Kumar of Manpura. According to information, a truck (HP12C-8347) was impounded at Dehradun on February 13 and it had produced two tax schedules where taxes of different states had been shown against same cheques. The case was sent to the Solan RTO by the Dehradun RTO, who had also affixed both tax schedules for verification. The trucker had shown cheque no 569209 of Rs 5,000 against tax paid for Uttar Pradesh in the original tax schedule while the same cheque was shown against Rajasthan. Similarly, cheque no 569210 was shown against Uttarakhand as well as Jammu and Kashmir. Interestingly, officials at the Solan RTA said the fake tax sheet carried identical stamp as the one on the original fake tax sheet. Similar stamps had been used while preparing fake permits of another truck (HP12C-8913 and HP12C-5485). Information about their fake permits had been received after these trucks were impounded in Uttar Pradesh in October and December last year. Officials had not ruled out the possibility of connivance of the employees of the RTO as the fake permits carried similar stamp mark as the original stamp. intriguingly, all trucks impounded for fake permits pertained to the BBN area. “We have stranded here for eight hours as the machineries reached late on the spot”, rued Piyush Malhotra and Pankaj Kapur, tourists from Punjab who were on their way to Manali. The daily supply of milk and other products to Mandi, Kullu and Manali had been delayed for hours and damaged cables disrupted the communications system. Apple trucks from Kullu and Mandi stuck on the road. Even officer-goers from Sundernagar reached late at Mandi due to breach in the bridge. The Suketi water had flooded the highway and brought the traffic to standstill since 5 am today. The bridge developed a 3-metre wide and 12-metre deep crack stranding commuters for nine hours on the highway till 2 pm when NH engineers filled the bridge restoring the highway for traffic. The NH-21 was damaged at two other places at the Mandi town bypass and at Pandoh due to landslides and falling of boulders. The traffic on several district roads also remained disrupted due to landslips triggered by the heavy spell of rains. Similarly, commuters had remained stranded on the highway near Shahpur for six hours today due to landslides on the Mandi-Pathankot highway. Executive engineer BS Barbal told The Tribune that the breach was plugged and traffic was restored around 2 pm. PC Katoch, executive engineer, Mandi-Pathankot highway, said they had restored the highway and put in three machines clearing the landslides for traffic. According to DSP Hari Ram, the complainant has alleged that her in-laws had started torturing her after two years of her marriage in October 2004. Earlier too in March this year, she had submitted a complaint against her in-laws but following counselling by the police, she agreed to return to her parents house but again the same problem started when she had returned. Reports said she fell on the ground and was crushed under the wheels of the truck coming from the opposite direction. The motor cycle was being driven by her nephew who also fell down on the ground but had a miraculous escape.